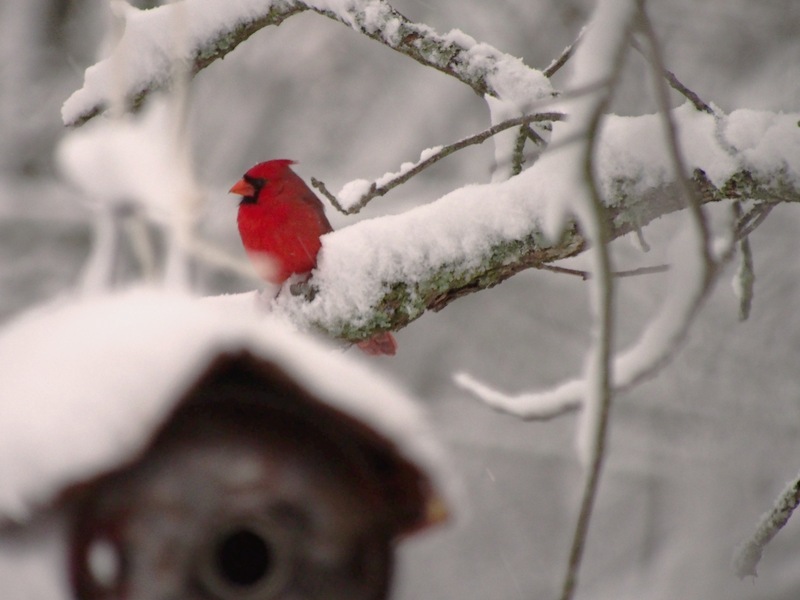 Spring in the Ozarks – redbuds, dogwoods, bluebirds, snow…SNOW? You heard me right, snow. Tonight we are under a freeze warning for the 3rd night in a row. I am heating the cellar to keep the pipes from bursting, I am wearing long-johns, I am stoking a fire – yeah, feels like Spring. My driveway on the first day of Spring. I suppose this view beats the bare trees, if it was warmer I would be out shooting macro shots of snowflakes on my daffodils. Before we get a mob together to take out that lying groundhog – there is an upside. 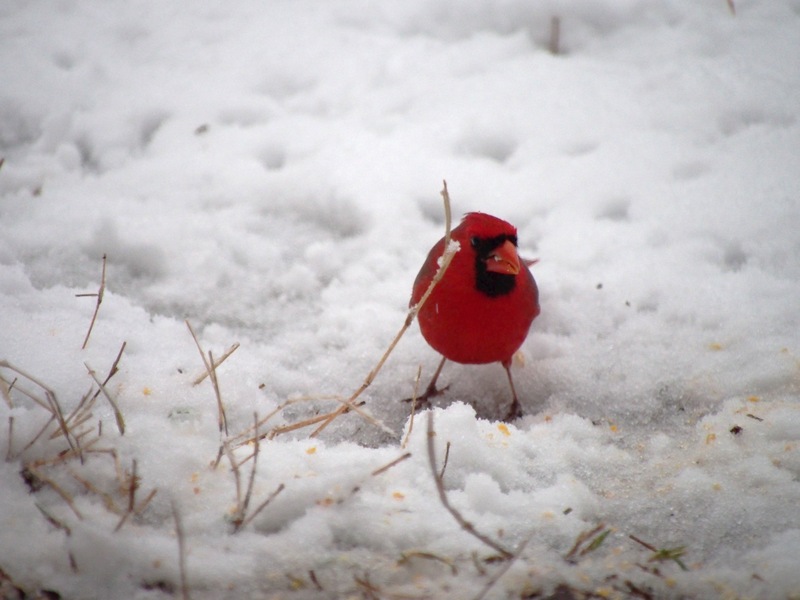 My snobby cardinals come out in droves in the snow. They must know that the contrast makes them look amazing. Of course, they can ignore me all day out there on the limb – but when the snow stops for a minute, they feed like there’s no tomorrow. 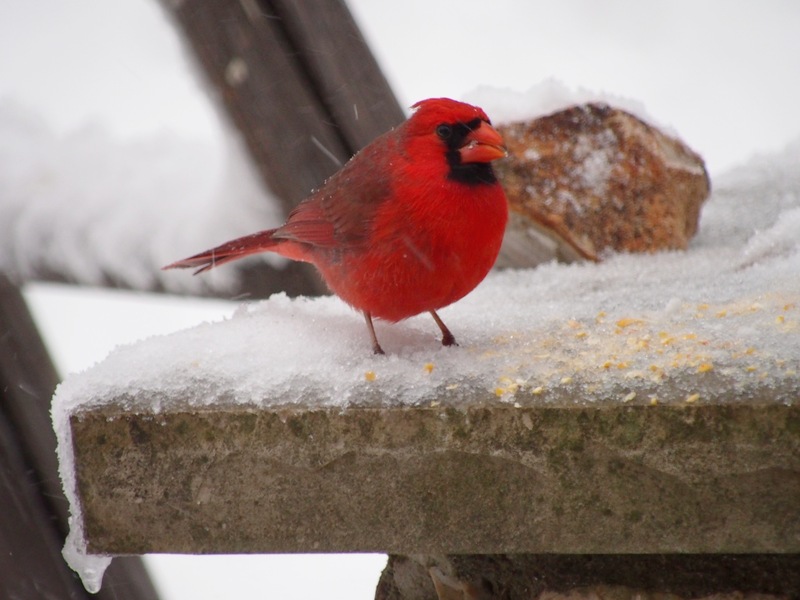 Out on a ledge feasting on cracked corn…Is it just me, or does he look inflated? No superstition here, he’s taking refuge under a ladder. Spring is supposed to return sometime around Wednesday. I’ll probably keep putting out that expensive songbird food they like so much. They will likely continue to ignore me. Ungrateful snobs, beautiful ungrateful snobs. I love them. 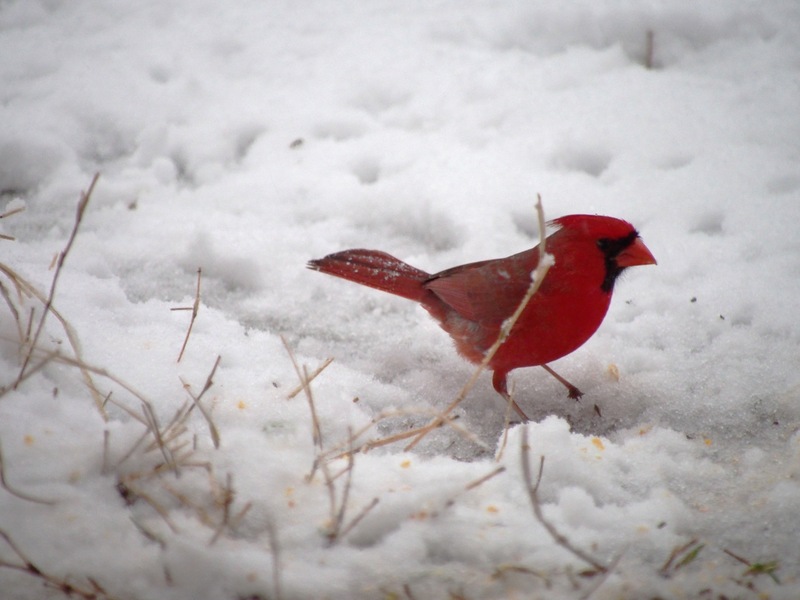 This entry was posted in birds, Ozarks, Photography, wildlife and tagged cardinal, Northern cardinal, Olympus, Olympus E-M5, Ozarks, photography, snow, Spring by artsifrtsy. Bookmark the permalink. 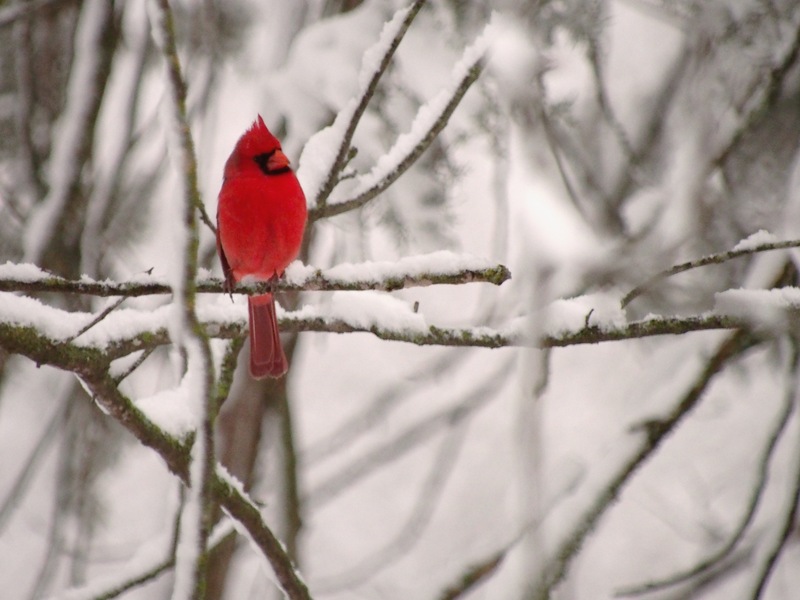 Beautiful contrast with the white and red. Lovely eye candy! 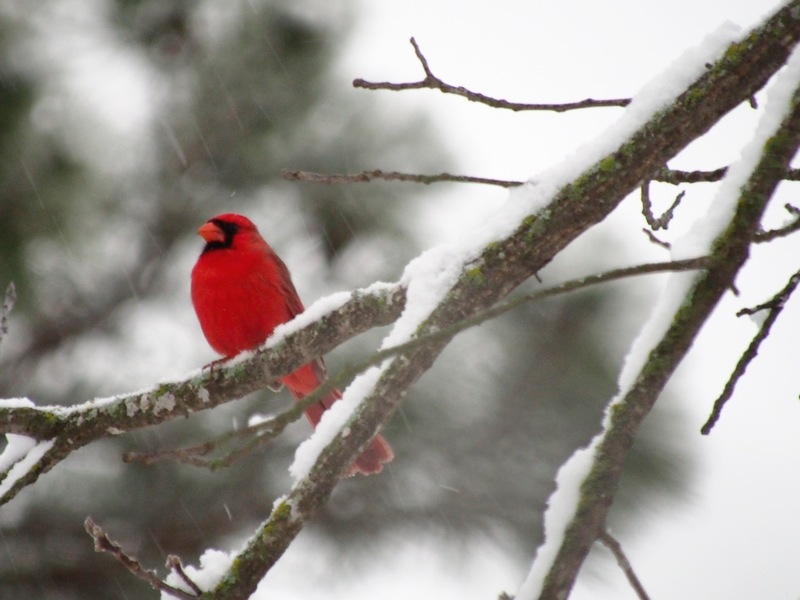 Those red cardinals look gorgeous against the white snow and I’m loving your images of them. Yep, he does look a little fatter (or pot-bellied). Probably ate too much. Nice to see some more snow – send it over to me (if you don’t like it) – today, we went back to hot humid summer heat (and worse tomorrow). I wish the seasons would get themselves all sorted out around the world. Thanks Vicki, they seem to puff up when the wind blows. My 99-year-old neighbor told me that she thinks the seasons are just a month off 🙂 We didn’t get a lot of snow, but it was very cold and windy until this morning. It’s only 24 degrees but with no wind it’s fine. I’m not ready for summer, but some sunlight would be nice. 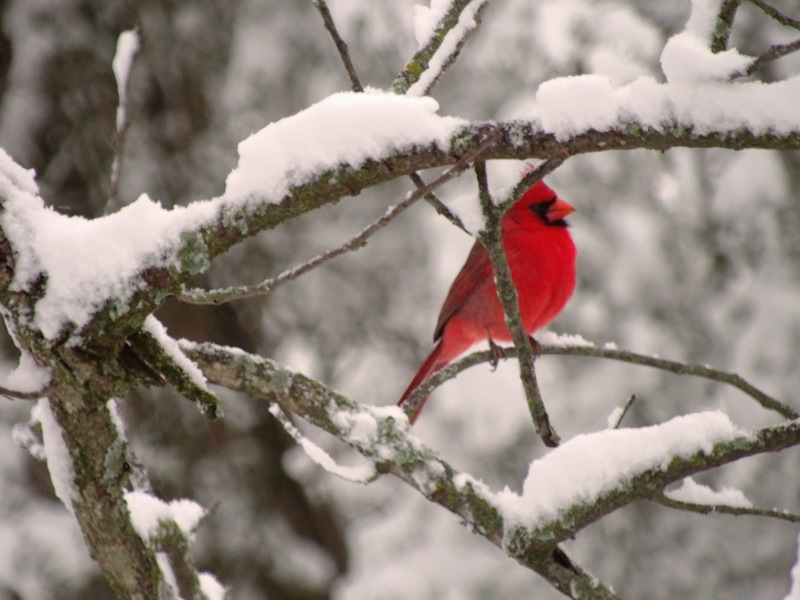 I love your gentle sense of humour and indeed, these birds look stunning contrasted against the snow. Beautiful post. I share your attitude on snow but these are beautiful and I think he is posing, do you think he knows he does not blend in with the environment? I’m certain that he knows he stands out. Sounds like you’re warming up to the whole idea of snow. I like my snow short and sweet. I don’t even mind being snowed in for a couple of days – but then I want it gone. I lived in the Cascades for about a decade and had those winters with over 150 inches of snow – it looks pretty and sledding’s a blast, but you got tired of it by Christmas. Yeah – one winter my dogs were able to walk over the top of my 5 foot fence. I remember sledding off a roof. I don’t miss shoveling a bit. Such cuties! He does look puffed up. When did you come to my house? Cuz that’s just what it looked like. And if you got a bunch of “unlikes” that was my fingers not my heart pressing the wrong damn keys! I LIKE this! LOL – I’ve been too crazy to notice any “unlikes” – but that happens to me sometimes too! My house is a bit further south that yours so it rarely looks like this in late March. I love them too. Thank you, Lorri! Thanks Bulldog – they do really show off in the snow. Wow, Lorri — just beautiful. My favorite was the puffed and posing one. 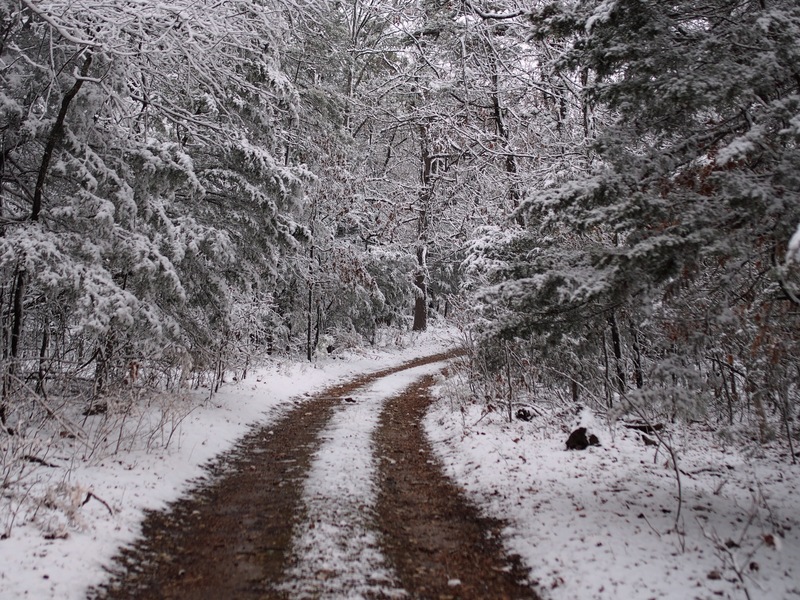 Your driveway is beautiful! Thanks Brigette – the driveway is like a tunnel to my secret meadow – as long as a football field and curves so you can’t see in. I like how they just puff up when they are cold – that could come in handy. I love pictures of birds. Great shots. They do seem pretty good at ignoring you. Maybe one of the neighborhood cats is teaching classes. Hah – yes, they do remind me of cats with that attitude. Old man winter makes once last ditch effort! Snobby cards don’t care. This made me smile. Big! 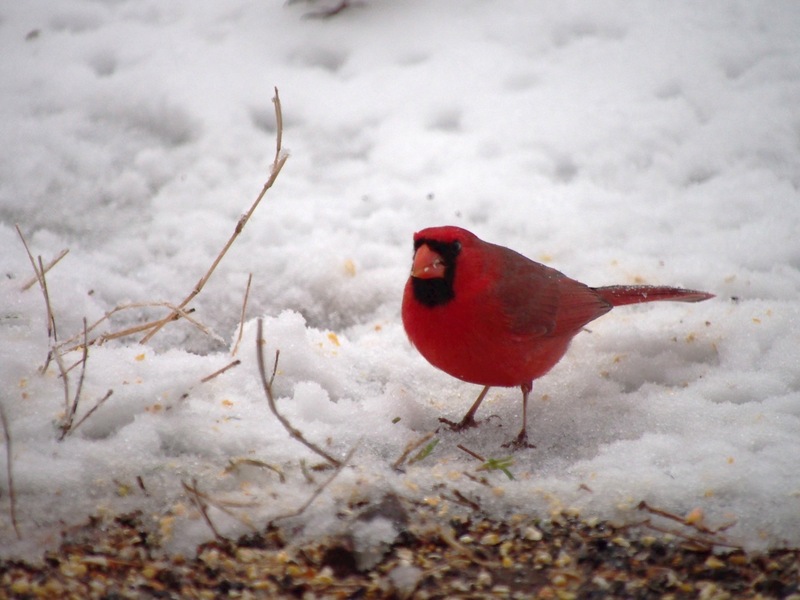 Glad you got a smile from it – This weather did give me that one shot at getting a cardinal in the snow shot. Sadly it was pretty dark and they are not as sharp as I like, but when you’re dealing with personalities like this you take what you can get. I’m sure they think I’m the paparazzi. 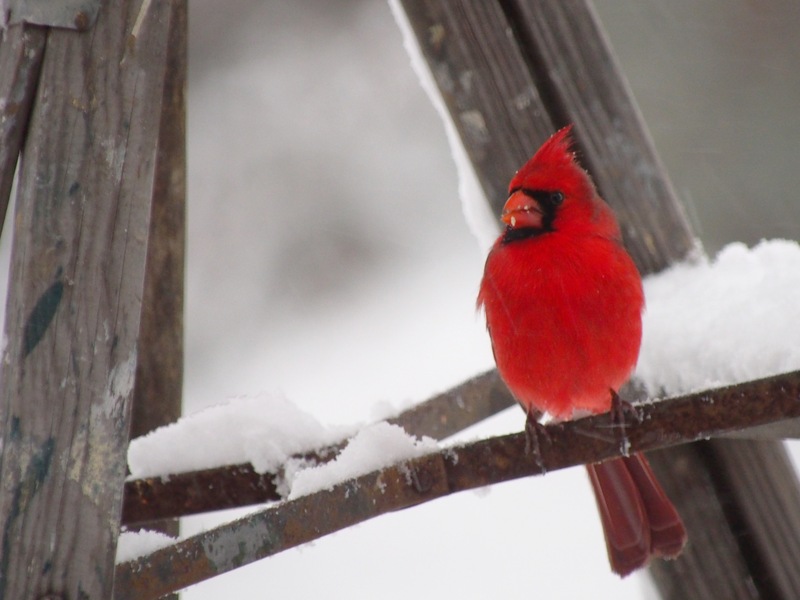 Nothing prettier than a red cardinal in the snow. Great shots. They were really fluttering in and out on Thursday when I took these shots. Still there heavily through the weekend with the cold. I am ready for some warmer weather and a long weekend. Thanks, I’m not so sure they love me, they tolerate me as long as I keep the feed coming. Snobs. Yes – a great deal like a cat. I’m a dog person.